There are a variety of plumbing related tasks that a handyman can handle, saving the time and expense of calling a union plumber which can see rates of $200/hr just to show up on site. With Chicago Handyman our $78 service call covers the first hour of handyman work. 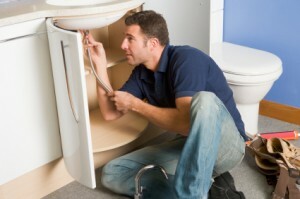 most plumbing issues we can handle are resolved within 30 minutes, so you may want to have a few more tasks in mind. Leaky faucets and under sink plumbing are both fine for a handyman to repair. You have had it with that old kitchen faucet and are ready to step up your game. You have found your new kitchen faucet at the home depot, but you don’t even want to try to understand how it goes in. That’s where Chicago Handyman comes in. No need to call a plumber, we can have you new faucet installed in under an hour. Your new faucet will be the highlight of your kitchen. Or maybe its your bathroom faucet, it doesnt matter, we are going to install it with precision and the utmost care. Leaky faucets are typically caused by a valve wearing down over time. The mechanism inside a faucet is often made of metal and rubber. With continued use, the valve will no longer stop the flow of water causing a continuous drip and a spike in your water bill. A dripping faucet can cause water waste of over 300 gallons a year according to the United States Geological Survey. Chicago Handyman can replace a faulty valve in no time, bringing your water bill back in line and alleviating your plumbing problems. No matter what the obstruction is, when your drain isn’t draining it can be… well… draining. Since the drain takes away waste water, it can be one of the most unsettling things to have a pool of tepid filth. Many clogged drains can be cleared with a plunger. When that’s not doing the trick, its time to bring in the drain snake. The long gross metal spring that fishes its way through your drain pipe attacking the clog with a spinning vortex of metal and vigor. This will clear the blockage and cause your pipes to flow freely again. When do you need a Licensed Plumber? When you have a major leak in your home, a pipe bursts, or you have plumbing that is behind a wall, you will need to bring in a licensed union plumber. However all bathroom fixtures including sinks and vanities, toilets, tubs and showers can all be handled by a knowledgeable handyman.